“I’m not creative” is one of the most frustrating things people say to me. To define yourself by what you can’t achieve misses the point: creativity is not the end result, it’s the journey we take to get there. We are all creative: it’s in our DNA. I’ve spent some time exploring creativity in the context of learning: through art, music and other media. I’m trying to refine these ideas now, to tease out a structure for understanding creativity and innovation within an organisational context. The Social Age requires agility: the ability to create meaning within communities. The challenge for organisations is to create spaces for experimentation, spaces to play, spaces to learn. We need to provide permission to think differently. Within these spaces, individuals and communities can play with the learning, conducting ‘sense making‘ activities and sharing their stories in the form of personal and co-created group narratives. Today, i’m reflecting on internally and externally moderated creativity. Internally moderated creativity is that which takes place in our heads and through our actions: whilst shaped by our learnt frameworks of thinking, it’s essentially a lone and unstructured activity, seeking inspiration and waiting for it to strike. 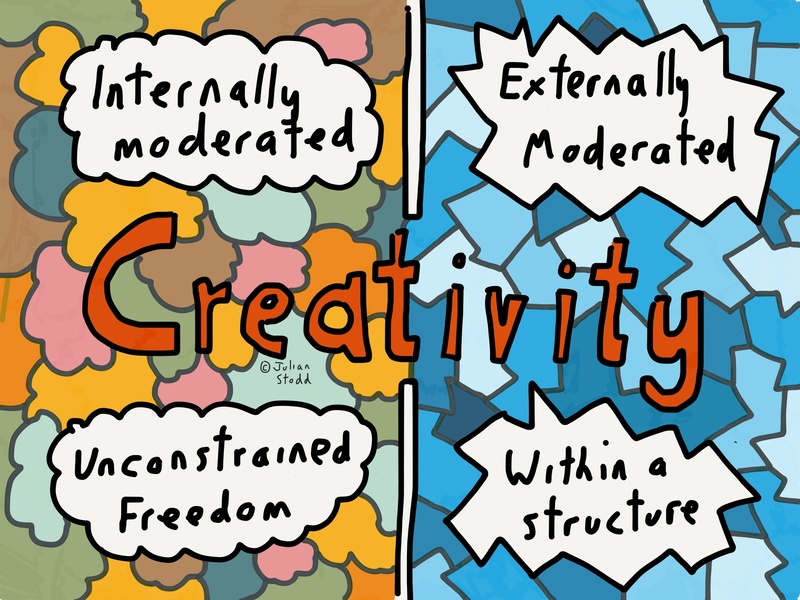 Externally moderated creativity is that which takes place within a structure of some sort: a structure that may actually provide additional impetus and momentum to the process, certainly a loose structure that can help develop creativity in organisations without introducing risk. I’m being pragmatic: this isn’t about being Rembrandt or Picasso, it’s about being more agile at work and creating new opportunities for both ourselves and the organisations we work within. There are benefits for organisations that actively create frameworks and permissions for creative thought: engineering in the spaces, technologies and structures that allow us to think differently. Technology alone won’t cut it: the technology may facilitate the creative thinking, but it won’t trigger or guarantee it. Technology is more about enabling us to form communities around ideas and share our stories widely. It’s the mechanism of amplification rather than the trigger. The permission piece is important: permission is about both rules to govern behaviour and the metrics used to reward or punish it. We have to be clear on permissions and clear how we measure the outputs, as well as being clear on the permanence of mistakes and the consequences of failure: if we encourage agile working, failure is assured and welcome. 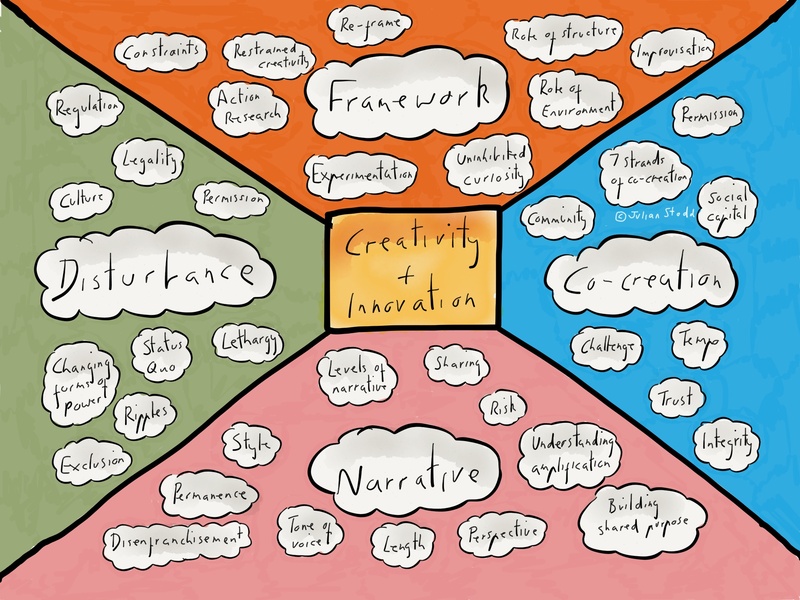 What are the elements of creativity? It’s not about throwing away the old, but it does involve questioning it. Creativity may be both the process we use in that questioning and also the way we describe the output, but it doesn’t have to be both. For example, a create problem solving approach in business may result in the most pragmatic and boring solution, but one that’s effective. It’s not about making things creative in an artistic sense. Although a benefit of allowing and rewarding creative thinking is that we may create more artistically creative outputs! A process for creativity is not one that defines the outputs: by it’s nature, that type of process is what creative thinking subverts. Rather it’s a structure for thinking, testing, sharing and learning. A piece of modern art may be challenging in it’s subject matter, in it’s execution, but the physical processes required to commission, build and display it may be exceptionally mundane. I have a friend who was commissioned to build an organ, to be displayed in the Southbank Centre. It had to be played by children, largely unattended, so needed to be robust and also engaging in both form and performance. The resulting device was somewhat steampunk: involving a bicycle and a lot of plumbing supplies, but the main concern of the organisation was whether it would fit through the doorway. If you start out thinking what will fit through the doorway, you may not achieve your potential. But if you create something amazing but that can’t fit through, it may serve no purpose. Externally moderated creativity is about the framework to meet both needs: it’s about allowing the steampunk mindset whilst ensuring it fits through the door. Understanding foundation concepts can enable us to be more creative in our thinking and execution. For example, i recently read a little about value chains: it’s a simple concept, but one that has helped me shape the business enormously. Essentially it’s about thinking out of all the things you do, what actually adds value, and what are you doing simply because you’ve always done it or assumed you always have to do it. Agile businesses do the things that add value and push out the things that habit has embedded into our routines. The ways we push those things out may be creative: using external suppliers, adapting process or creating technology. PayPal is a creative solution to a Social Age problem: i don’t trust every online retailer, but i do trust PayPal, and it also means i only have to remember and update one account. They sit within the retail experience, but just at one point: payment. They’ve not opened their own store or offer delivery by drone, they just process my payment effortlessly and safely. From a retailers point of view, why develop your own payment processing capability when you can use PayPal and focus your efforts on adding value elsewhere. If we paint by numbers, we are still painting, but we may not be being creative: we are replicating, not innovating. Look at music: when an orchestra plays, it requires two dimensions of control. The first is the expertise of each individual musician. They need to be able to read music, produce a great sound and play in time with their colleagues. If you’re a soloist, you need to be able to do all that and also inflect your playing with emotions and colour, to bring the music to life. This is all a form of internally moderated creativity, but there is also a conductor: an individual whose role it is to coordinate and invigorate the music. Whilst as a musician i start from my direct experience of my hands upon the instrument and the feedback through my ears and body, the conductor starts from the perspective of the full sound: they are looking at the whole story when we are looking at individual words. External moderation provide a feedback loop, it helps give direction and structure to the activity with a holistic viewpoint. 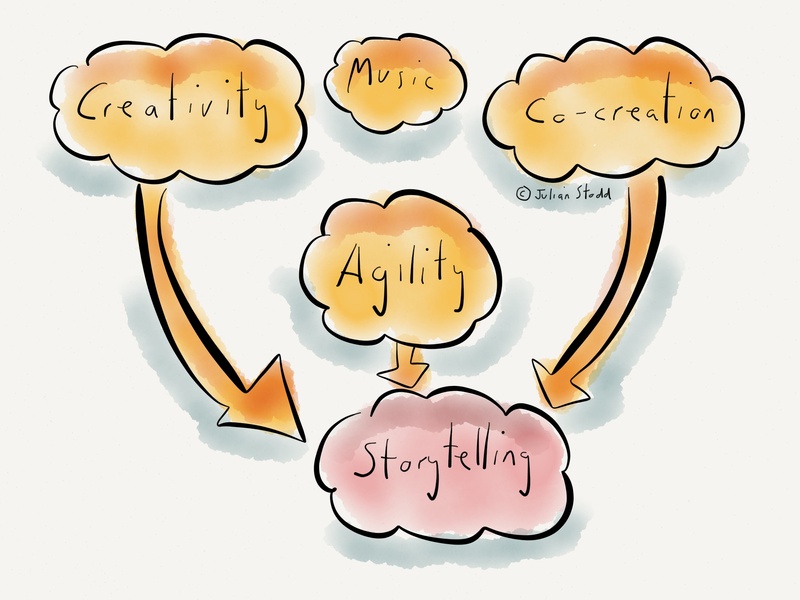 Encouraging creativity helps organisations to be agile in the Social Age. Agility is about questioning, about reflection and learning. 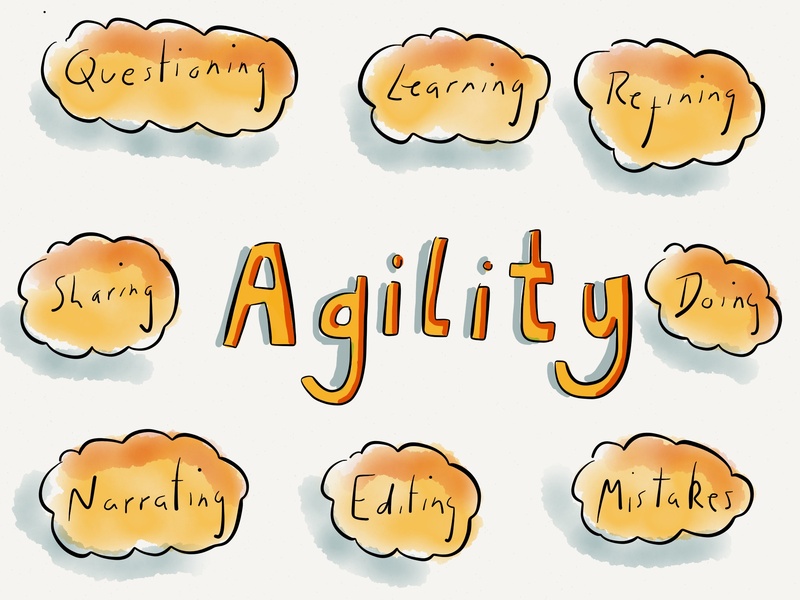 Agility is about solving problems today and doing it again, differently, tomorrow. I believe that only agile organisations will be fit to meet the challenges of constant change and evolving business environments in the future: organisations that are able to adapt and provide provocative spaces for free thinking. We can rely on creativity spontaneously emerging, or we can foster it through active engagement. Understanding how communities form and the purposes they serve is a start. Developing a framework for organisational creativity is the next step, something i’m working on this summer. Creating the right permissions for it to be used is also key. Permission to think and act differently. If we only address part of the issue, our solution will be incomplete and fail: you can easily create disturbance, but if you fail to nurture the communities and conversations, you fail. We can easily implement technology, but if we don’t understand what purposes the communities serve that this facilitates, we will fail. We can easily put in place rules and processes, but if they’re not co-created with great authenticity by the community, they will fail. Why? Because creativity isn’t about process, although it can be about frameworks. It’s equally about mindset and permissions. Get that right and the rest will follow. Mindset is right at the heart of any value chain. Nearly all organisations operate with devolved responsibility: our most common day to day interaction with that is the structure of teams and projects. Those entities operate within the overall organisational structure, but take ownership of specific duties, projects or operations. For us to feel we can be creative in our thinking within these spaces, we need to look at how to give the right permissions at this team level. We have to understand the audience and impacts: if we restrict thinking with too much thought of what we’ve done before, our actions will replicate that. But if we abandon that tribal knowledge and coherent process, we may lose focus. Instead we have to create pockets for creative approaches, whilst maintaining some structure, and we address the actions and outputs from these spaces accordingly. An instinctive organisational reaction to the word ‘creativity‘ is to imagine it’s somehow soft, somehow unscientific and unquantifiable. We tend to compartmentalise people in the somewhat derogatory categories of ‘creative‘ types (or ‘techies‘) as if the two are somehow opposed. This dichotomy is false and divisive: it leads to people imagining themselves into boxes of their own construction and limiting themselves accordingly. To be creative, you just have to be willing to think differently. It’s about the journey, not the output. This entry was posted in Creative and tagged Agile, Agility, creative thinking, Creativity, Longreads, Process, Social Age. Bookmark the permalink. Hi Julian, thanks for the great post 🙂 I’ve been really encouraged and challenged by all that you’ve said about creativity. I guess it’s so limiting to define yourself by what you can’t do. All your illustrations are beautiful and super informative. How do you create them?